(TibetanReview.net, Mar14’16) – Tibet’s exiled spiritual leader, the Dalai Lama, returned to a warm and solemn welcome to his Dharamshala home, India, on Mar 13 after being away in the United States for treatment for a prostate condition. The Dalai Lama was undergoing what was described as corrective surgery at Mayo Clinic in Rochester, in the US state of Minnesota. While there he gave public talks and religious teachings as well and also took part in a panel discussion. 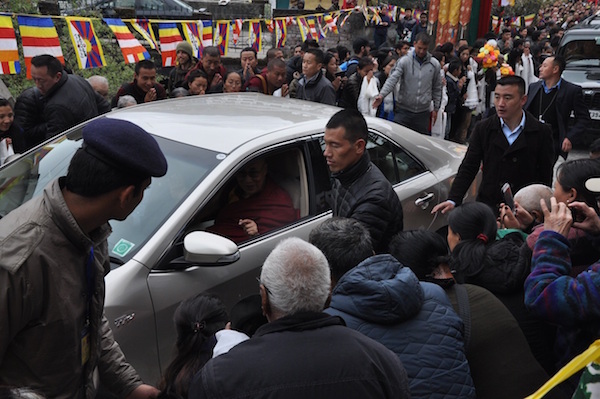 The Dalai Lama had left Dharamshala on Jan 19. Before arriving in Dharamshala, he took part in a panel discussion with other Nobel Peace laureates on the sideline of the UN Human Rights Council in Geneva on Mar 11. The Dalai Lama’s next overseas tour takes place in Salt Lake City, USA, where he will give a Public Talk on Jun 21. He will later take part in a Mind & Life Dialogue in Brussels, Belgium,over Sep 9-11, and give religious teachingsand a public talk in Strasbourg, France, over Sep 17-18.